I have a 1956 Chris-Craft 16 foot inboard utility in need of restoration. It is the boat I learned to ski behind back in the 60's. The hull and the transom both probably need to be replaced/re-sheeted with new plywood that is about 1/2 inch thick. I'm looking for info on what plywood to use and the process and materials used to replace it. I'm also looking for info on how to clean out the old gas tank. The boat is still in the barn, but I'm starting research on how to do it right. I would like to know what type of plywood to use and general idea of how it is applied. As far as plywood is concerned, it is always best on any boat to use the best quality Marine grade plywood. Any extra you pay for top quality Marine grade, regardless of whether it is epoxied or not, is money well spent. “1/2 inch in thickness” sounds about right for the transom but I shouldn’t think that the bottom ply is that thick. Originally these boats had their bottoms planked in two layers with a layer of canvas, treated with white lead and linseed oil, in between. Over time the canvas degrades and becomes less waterproof. So this will probably need replacing. Some folks have used fiberglass to do this but my own preference is to avoid this, epoxy is too stiff and will eventually crack. Using the 3M 5200 system will allow the boat to remain flexible while keeping her watertight. I guess your first job should be to strip the paint off so you can see what is underneath. 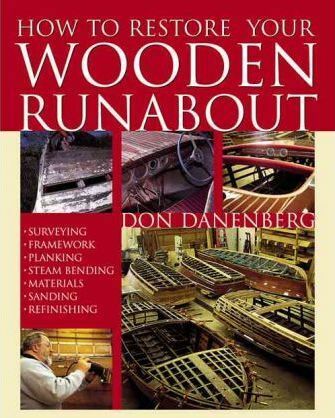 Don Danenberg’s book "How To Restore Your Wooden Runabout" is an excellent reference work, if you can get hold of a copy, without paying an arm and a leg for it. I have a 1962 Correct Craft plywood runabout that has minor hull damage in the area of the prop. My thought is to cut out damage and replace with new material using a lap joint. I'd rather not block the repair and make it obvious. Is 3/8" ply too thin for a lap joint? The previous commenter has given great advice to read the Dannenberg book. This cavalier plywood bottom is easily replaced. Flip boat and level, clean frames well and saturate with smiths penetrating epoxy. Okume marine ply is best and I believe 2 6mm plies epoxie glued makes the strongest molded bottom. Seal or paint inner surface and fasten the first layer with 5200 and boat nails to your frames then roll west system epoxy to both surfaces and fasten 2nd layer with 10x2 silicon bronze screws, seal and bottom paint. The sides are 1 layer of 9mm scarfed in the middle.